4.5 starsFull review can be found here.Historical romance seems to be one of my weaknesses. It’s not a genre that’s usually particularly inspiring and often enough the books are set in England (or Scotland) but written in modern day American English, which bugs me to no end. I haven’t read very many historical anythings set in the Americas but I’ve been brought up around a grandmother who happens to be overly fond of westerns, so when I read the synopsis of this one I was intrigued. The American west in that period was still very much on the wild side and that sort of setting appeals to me, possibly because it’s such a far cry from anything to be found these days.The author managed to really capture the feel of the period for me. I felt transported. I could just imagine this little western town they were living in! It was obvious that she did a lot of research and went to great lengths to make her period feel authentic – research and great lengths that definitely paid off for me as the reader.It was also interesting to see the process of getting gold and silver from the ore and how the refineries (that might not be the correct word but it’s the only one coming to mind right now) were operated. There was a slight issue here, however, in that the information was too clumped for me. Wes gives Julie a tour of her uncle’s “refinery” and explains the processes to her, which is a good example of exposition through dialogue. My issue was that there was too much information too fast for me to really absorb it properly. It didn’t help that I was already tired and so a large amount of what is essentially nonfiction coming at me all at once felt more like a barrage of facts than part of the story. I understand what the author was doing, but my mind just couldn’t deal with it.Thankfully these “info dumps” were few and far between and I was able to really appreciate the intricate story that the author was weaving. As a historical romance it does, of course, focus mainly on the budding relationship between Wes and Julie but there’s enough going on around it to keep it well balanced. I didn’t feel completely swamped by just the relationship and it wasn’t love at first sight (though it was lust, but I’m happy with lust. Lust is normal).Wes being an undercover officer for Wells Fargo was also of particular interest. I have to admit that I didn’t even know there was such a thing as Wells Fargo; never mind what its role was. So I actually learnt bits of American history from reading this book! That’s something that always appeals to me in a book. 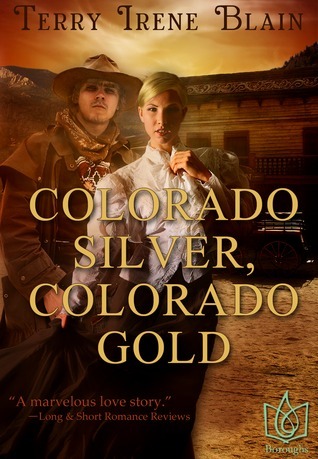 Today, I'm reviewing the cute and fun historical romance, Colorado Silver, Colorado Gold. Terry Irene Blain has managed to take a scenario that is somewhat predictable in historical romance and turn it on its head.The story centers on Julie, a young woman fleeing to Durango, Colorado to escape the secrets she left behind in Philadelphia.Durango is also home to another new transplant, the dashing Wes Westmoreland. He is an undercover Wells Fargo agent, posing as a man-of-all-trades looking for work in the town's silver and gold smelting companies.Julie has also found comfort in the smelters, working in the office for her uncle. Set in the late 1800s in a gold mining town in the West, Colorado Silver, Colorado Gold has the potential to be another dime store romance. Luckily, there is no discounting Blain's sheer talent. Her ability to craft deep characters catapults the story from ordinary to a damn good read.Julie is whip smart, albeit a bit sheltered. She is strong and savvy and unwilling to accept that she should walk two feet behind her man. She is also flawed, afraid of everyone uncovering her secrets or learning that she is not always so sure of herself. Her attraction to wild man Wes scares her, forcing her to hid behind proper social behaviors to avoid giving into her growing passion.Wes is equally damaged, having grown up a saloon kid, he is used to being used and dismissed. It makes him wary of his attraction to Julie. He also knows his time in Durango is limited, and fears that starting a relationship will damage his position with Wells Fargo. After all, working undercover is not so conducive to putting down roots.I will admit at times the story was slow. Unlike some romances, Julie and Wes' relationship is not a passionate blaze. Instead it builds slowly, with the romantic apex coming near the end of the story. The slow parts are minimized by Blain's talent to transport her readers to a new time and place. I could clearly picture dusty, Durango as it was in the late 1800s.Blain also has a knack for building adventure and mystery into the romance. It reads beautifully giving this story an edge of the plethora of poorly written, predictable romances on the market today.Disclaimer: I was gifted a copy of this book for review, however all opinions are my own. Yes, this is another easy-to-read historical romance, but I have to admit that I rather liked it. This is the second book I have read by Terry Blain, and I actually enjoyed this one more than the first (which doesn't make sense since this book is older, but that is just my preference). I found this book much more historical, and there was actually something happened that I did not see coming.Julie is an absolutely delightful character--your normal, typical, strong, old-fashioned woman. Though rather stereotypical, I truly found myself pulling for her. And her relationship with Wes does become somewhat complicated. It was interesting to discover that some of this book was actually true when it came to historical facts. That always resonates with me, and it makes me love the book even more.The profanity in the book was quite mild, but it was there. And the bedroom scene was a little more descriptive than what I like. But I will say that the romance did not strike me as being too sappy. Maybe a bit at times, but it seemed genuine and entertaining.This author has one of the easiest historical fiction read styles that I have read, and it is nice that you can pick the book up and have it finished in an evening. It does not require a lot of over-thinking, and your mind can even take a little vacation. Until Ms. Blain wakes it up!Yes, this is predictable, but it is nice and light for the end-of-the-summer read. If you like historical romances set in the West, this should appeal to you.I was sent a copy of this book in exchange for my honest review. I was not financially compensated, and all opinions are 100 percent mine. I think Terry likes writing about widow's. This is the second book I've read where the heroine either was a widow or was pretending to be one.I really enjoyed this story for the most part, the characters were well rounded and you got to know both Julie and Wes really well, especially the back story, which is always important. Wes was a strong hero, but not overbearing and I liked that he really cared for Julie almost from the start. I hate when heroes are too "alpha male." That always makes me wonder why the women want them. Wes was more a smart man, a little self deprecating, because of his own upbringing, but that made him more endearing.The only part of the story I wasn't too thrilled about was the ending. It came about too quickly. I think this book could have benefited from a few more pages, so that things could have been wrapped up better. I definitely like Terry's writing style and if you like Western Historical Romances, you really should give her a shot. She spins a good tale. Historical Romances are exciting, thrilling, and they can get your blood pumping as well as if you were running a mile. Terry Blain is a stupendous storyteller. You can tell from her attention of the smallest details to the historical facts she includes in her books that she absolutely loves what she does for a living. Colorado Silver, Colorado Gold is a wonderful love story about the struggles of early Western America and the triumphs the hero and heroine face together and individually. Juliette and Wes are characters that you can instantly fall in love with and continue to root for even after you are done reading. I was really sad to see the book come to a close but only because I wanted to know more of what those two might get into next. If you enjoy a wonderful love story wrapped in an early American setting then this is definitely the book for you. Once I started reading Ms. Blaine's book, I could not put it down! Enjoy! I always love to see a strong hero which just a touch of vulnerability. Wes Westmoreland is strong and confident in his professional life, but because of the way he was raised, he doesn't believe he is good enough for a wealthy woman like Juliette. Watching the two dance around each other was just as interesting as wondering about what Juliette had hidden in the mysterious valise. I didn't want to put the book down. Wes and Juliette both have secrets and I couldn't wait to see what would happen when those secrets came out.I received this book free from the author in exchange for an honest review. With a well thought out plot and characters, Ms. Blain pens "Colorado Silver, Colorado Gold". A wonderfully written historical romance that gets you from the first page. Recommended for everyone who loves romance and history.This review is based on a complimentary copy which was provided for an honest review. Historiacally accurate to the best of my knowledge. Very similar to another story I read recently. Mine town, undercover lawman with emotional baggage falls for damsel in distress. This book was a great read for a first time reader of historical romance! I truly enjoyed the flow of the story. Although this was fiction, Blain was able to closely relate to the true history.